When you were growing up, your parents were your care givers. They made sure you were safe, well fed, clothed, had medical care, and that the money was there for the things you needed. But being your caregiver was about more than them just providing you the basics of survival and health. Now your turn has come to be the care giver for your parents. They need you now as they move into their older years and they are less able to attend to those basic needs of life. You can assure they are safe and that they have the right food to eat for their diet. You can make sure their clothes are clean and that their medications are there for them every day. You also can look after their finances so there is plenty there to take care of the necessities of life and none is wasted or taken from them by scam artists. But just as growing up in your family, there is another element of being a care giver and that element can be boiled down to the phrase, “quality of life.” That is a good phrase because if your childhood had times of joy and happiness because you were part of a loving family, that was because your mom and dad went beyond the physical basics and made your life fun, full of love and laughter and good times that you would remember forever. Perhaps you sit and remember those times with your elderly parents even today. But as you remember those terrific vacations or all the wonderful holidays and the many funny things that happened in your family when you were growing up, two people made sure your life was rich and full that way. And those two people are these same two people you are now charged to care for – mom and dad. - Dinner every week. If you have a routine time when you either come to your parents' home and bring dinner or have them to your place to enjoy some family time, that will become a favorite night of the week for your elderly senior citizen. - Lots of family time. The real value of being in the same town as your parents is they can have lots of time with your family. So let them be part of many of the family things you do such as church, school activities and fun outings during the spring and summer as well. - Make the holidays festive. What would the holidays be without Grandma and Grandpa? - Make their house a home. As a caregiver, sometimes the chore of cleaning and maintaining your parent’s apartment falls to you. But don’t just “settle” for a nice clean look. Dig out those great things that mom used to have on the walls and shelves at home when she had her own place. Try to give that room at the senior retirement center as much like home as possible so she will feel comfortable and happy among the things that mean this is her place and hers alone. If you can create the same joy, the same fun and the same sense of “home” for your elderly parent that they were able to create for you and your siblings growing up, then you will have taken one more step toward giving back a little of what was given to you. But there is a real value to giving your retired parents the same love and good times they gave to you. 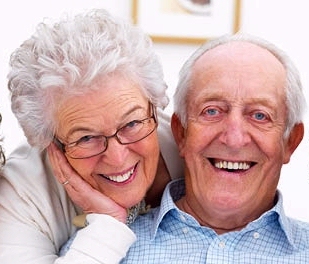 Laughter and love and happy times are therapeutic and can do a lot for the health and well being of your retired parent. So put that extra creativity you have into really giving to your parents the quality of life they gave to you and they will blossom where they are planted, just you and your siblings have in life.